Microsoft .Net Development Company | Program Developers in Raleigh NC -or- Dot .Net Programming Dallas TX -or- Dot .Net Programming Miami FL? Our Dot .Net Programming and Dot .Net Development services in Raleigh NC, Dallas TX, Miami FL and throughout the USA includes applications within the Healthcare, Financial, Manufacturing, Telcom industries and more. A highlight of G&G’s .Net programming, development services with a highly experienced Dot .Net developers team among Web development companies & an Overview of .Net Development FrameworkAlmost from the introduction of .Net framework by Microsoft in 2002, G&G’s .Net developers have been engaged in .Net programming and Dot .Net development. Initially we were addressing needs of our client companies who were looking for a strong OO web development environment alternative to Java services on Windows platform. Since then we accomplished numerous .Net development projects for our US, European and global clients for various industry applications, in the areas of Healthcare, Financial, Manufacturing, Telecom, ePublishing, and more. Dot .NET is Microsoft’s strategy of software that provides services to people any time, any place, on any device. An accurate definition of .NET is, it’s an XML Web Services platform which allows us to build rich .NET applications, which allows users to interact with the Internet using wide range of smart devices (tablet devices, pocket PC’s, web phones etc), which allows .Net developers to build and integrate Web Services and which comes with many rich set of tools like Visual Studio to fully develop and build those applications. UDDI: Stands for Universal Discovery and Description Integration. It’s said to be the Yellow Pages of Web Services which allows Businesses to search for other Businesses allowing them to search for the services it needs, know about the services and contact them. WSDL: Stands for Web Services Description Language, often called as whiz-dull. WSDL is an XML document that describes a set of SOAP messages and how those messages are exchanged. SOAP: SOAP, Simple Object Access Protocol is a simple, lightweight protocol for exchanging information between peers in a decentralized, distributed environment. It is an XML based protocol that consists of three parts: an envelop that describes what is in the message and how it should be processed, a set of encoding rules and a convention for representing remote procedure calls and responses. XML, HTTP and SMTP: Stands for Extensible Markup Language, Hyper Text Transfer Protocol and Simple Message Transfer Protocol respectively. UDDI, WSDL and SOAP rely on these protocols for communication. The image here shows the order of the protocols on which Web Services are built. To provide a consistent object-oriented (OO) programming environment whether object code is stored and executed locally, executed locally but Internet-distributed, or executed remotely. The .NET Framework has two main components: the common language runtime and the .NET Framework class library. The common language runtime is the foundation of the .NET Framework. .Net developers can think of the runtime as an agent that manages code at execution time, providing core services such as memory management, thread management, and remoting, while also enforcing strict type safety and other forms of code accuracy that promote security and robustness. In fact, the concept of code management is a fundamental principle of the runtime. Code that targets the runtime is known as managed code, while code that does not target the runtime is known as unmanaged code. The class library, the other main component of the .NET Framework, is a comprehensive, object-oriented collection of reusable types that developers can use, during .Net programming and development, to develop applications ranging from traditional command-line or graphical user interface (GUI) applications to applications based on the latest innovations provided by ASP.NET, such as Web Forms and XML Web services. Internet Explorer is an example of an unmanaged application that hosts the runtime (in the form of a MIME type extension). Using Internet Explorer to host the runtime enables .Net developers to embed managed components or Windows Forms controls in HTML documents. Hosting the runtime in this way in .Net development makes managed mobile code (similar to Microsoft ActiveX controls) possible, but with significant improvements that only managed code can offer, such as semi-trusted execution and isolated file storage. 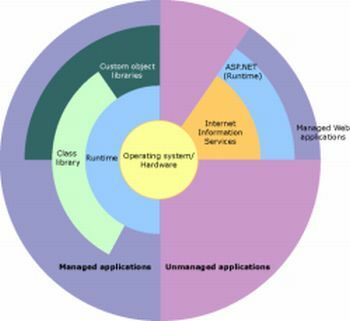 The illustration here shows the relationship of the common language runtime and the class library to your applications and to the overall system. The illustration also shows how managed code operates within a larger architecture. Features: .NET and J2EE offer pretty much the same laundry of list of features, albeit in different ways. Portability: The .NET core works on Windows only but theoretically supports development in many languages (once sub-/supersets of these languages have been defined and IL compilers have been created for them). Also, .Net’s SOAP capabilities will allow components on other platforms to exchange data messages with .NET components. While a few of the elements in .NET, such as SOAP and its discovery and lookup protocols, are provided as public specifications, the core components of the framework (IL runtime environment, ASP+ internals, Win Forms and Web Forms component “contracts”, etc.) are kept by Microsoft, and Microsoft will be the only provider of complete .NET programming development and runtime environments. J2EE, on the other hand, works on any platform with a compliant Java VM and a compliant set of required platform services (EJB container, JMS service, etc., etc.). All of the specifications that define the J2EE platform are published and reviewed publicly, and numerous vendors offer compliant products and development environments. But J2EE is a single-language platform. Calls from/to objects in other languages are possible through CORBA, but CORBA support is not a ubiquitous part of the platform. Microsoft’s passport service is an example of a .NET service. Passport is a Web-based service designed to make signing in to Websites fast and easy. Passport enables participating sites to authenticate a user with a single set of sign-in credentials eliminating the need for users to remember numerous passwords and sign-in names. You can use one name and password to sign in to all .NET Passport-participating sites and services. You can store personal information in your .NET Passport profile and, if you choose, automatically share that information when you sign in so that participating sites can provide you with personalized services. If you use Hotmail for your email needs then you should be very much familiar with the passport service. .NET is the framework that has magically eased a lot of troubles and facilitated the designing of efficient and user-friendly object-oriented (OO) web applications thereby revolutionizing the concept of “web-surfing”.